So the gnarly trio from Denver, Colorado have returned with a new EP full of hatred and disgust at the human race. 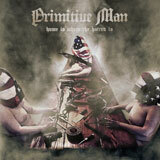 Primitive Man is a band with a particular sound, not for the faint hearted. In 2013 they unleashed their debut Scorn and now they return with Home Is Where The Hatred Is. The band is currently on another European tour, last year I witnessed the hatred of these Americans live. A nihilistic experience, almost cathartic. This year the band brings their sound to Roadburn again so I’m eager to hear what they have to offer this time. Opener Loathe was previously released as a single in-between the many splits the trio has released in the meantime. It’s a gruff and menacing track, full of dissonant noises, screaming guitars and crushing blows to the bass drum. It’s an eleven minute descent into the black ball of hatred that forms the core of Primitive Man. The slow but heavy tread of the song marches, slowly shattering all around it. A the end only the raging bark of Ethan Lee McCarthy remains. Well, that’s all well and doomy, but then the band launches into the violent Downfall. Picking up the pace with a grindcore gallop, combined with punishing sludge. The words are roared in anger at the listener, sometimes almost turning into shrieks. Towards the end, the song speeds up again, adding some blast beats to the mix, while harrowing tones create a scornful atmosphere. Bag Man continues as a barrage of fury and despair, with lyrics that depict the abject in man in a profound and powerful manner. In a way the band makes you feel defiled as a listener for being human, for being part of this race of disgrace. The sheer noise of the guitars also betrays a weeping, a sadness in a way. Closing this record is the instrumental A Marriage With Nothingness. A four minute immersion into shrieking madness and the sound of moaning women. The discomfort of the noise, and the ecstatic moans offer a contrast that kicks you in the stomach with an unnerving feeling. The sounds keep swelling to what appears to be ecstatic highs combined with more distorted and unpleasant noises which then climaxes when the moans merge into the noise. Then silence remains. Primitive Man makes music to unhinge and to unnerve. You hardly need much more than this record to get that feeling.